Welcome to Hotel Kanha (Treasure in Forest) the resort is situated on the Mukki Gate Samnapur the Hotel is situated just 3 min walk dist from the National Park. Hotel Kanha is servering guest from year 2010. Kanha National Park Home to India’s majestic Tigers and numerous mammals’ reptiles and bird species the luxury property is surrounded by the park’s jungles and traditional tribal villages in the Samnapur Madhya Pradesh a central India state. The Hotel Kanha (Treasure in Forest) at Kanha provides refuge from the hectic world and an opportunity to enjoy the wonders on the nature in the wilds life in India. Here you’ll experience the adventure of the jungle magnificent scenery the romance of brilliant sunrise and sunsets and the comforts of home in your jungle retreat. Kanha Village Eco Resort is fully equipped wildlife lodge with beautifully appointed cottages and rooms in vernacular style. The appearance is similar to local tribal homes with facial designs on the walls giving the resort the look of a village. Luxury cottages are ethnic in touch with all modern comforts and luxuries. The Resort has 7 individual luxury cottages. Spacious with all modern amenities but traditional style interiors, individual Air conditioners / heaters, tea / coffee maker, cam fire facilities barbeque, outside cottages, natural list available in resort. And finest linen. We have two splash pools in the resort are, one is for adults and one is for children seperately. 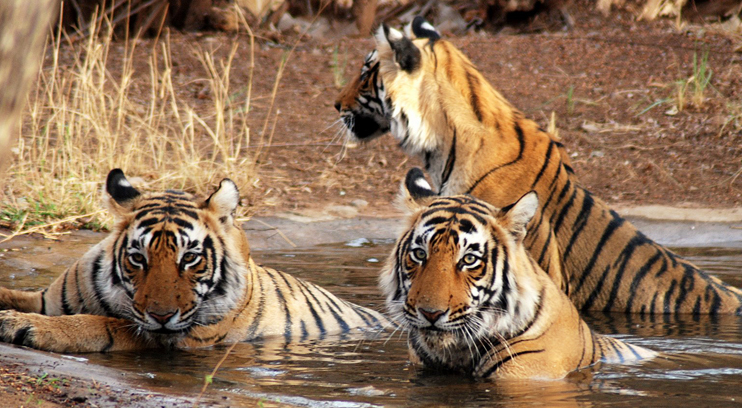 The splash pools are welcome for a jazzy bath after exhausting tiger safaris. The verandah is a sit in that offers calming view of Kanha scope. Copyright © 2017 Hotelkanha.com. All Rights Reserved.